In order to succeed in this evolving digital landscape, financial services institutions must embrace trending technology to remain competitive or risk becoming obsolete. Today’s customers expect to be able to bank not just anywhere, any time, but also on any device. What’s more, they want to be able to open new accounts, apply for loans, and perform other tasks that in the past could only be done at a branch, securely and easily. 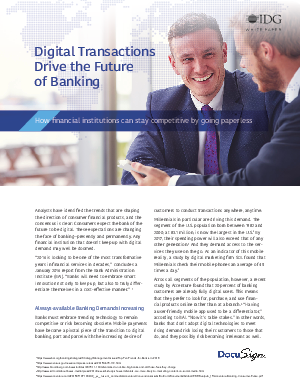 Download this complimentary IDG report to learn about digital banking best practices to stay competitive by going paperless, attract and keep the next generation of customers who demand digital options, and thrive in the digital age.